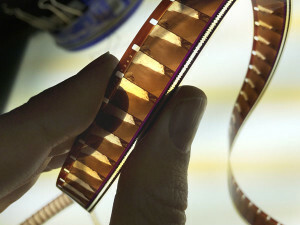 Since the Spring 2013 quarter I have sought to expand my knowledge and expertise in film preservation and restoration through practica and work experience. The following photographs demonstrate the skills I have gained in my practica at Film Technology, Inc. and the Braun Research Library, as well as my job in the Preservation Department at the UCLA Library. Although I had previous film handling experience stemming from working at Colorlab, a motion picture laboratory that specializes in film preservation, I decided to intern at Film Technology, Inc. to expand upon that knowledge. 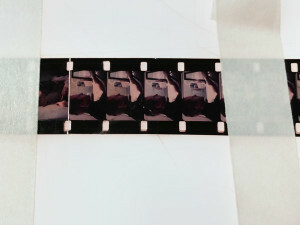 My practicum at Film Technology gave me the opportunity to handle and repair 35mm nitrate film, and compare various pre-print and print elements from Hollywood studio films to see which would be the best one to use in a restoration project. In addition, I was also able to learn about the various states of nitrate deterioration, digital sound restoration, as well as optical and contact printing. The photographs in the slide show below, illustrate some of the issues I came across in handling and repairing nitrate during my practicum. 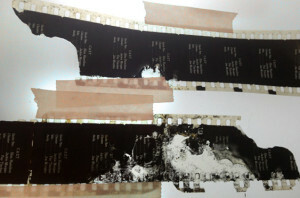 A major tear in 35 mm nitrate that was in need of repair. A tear in the frame and torn perfs that were in need of repair. 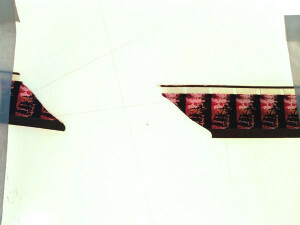 The repair made to the torn perfs. 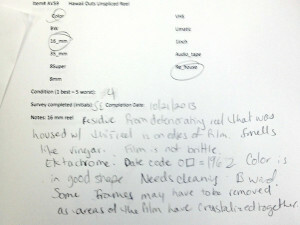 Deteriorated nitrate. 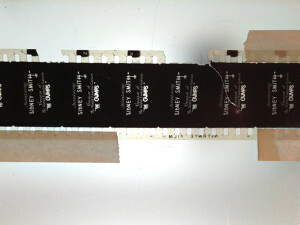 Notice how the emulsion has decayed and the film is beginning to lose the image. The Braun Research Library at the Southwest Museum had a collection of audiovisual materials that had never been surveyed. I decided to do my Fall 2013 practicum here because I was interested to see the beginning stages of preservation, before items arrived at a motion picture library. I used the knowledge I gained in my Preservation of Heritage Materials course (IS 432), to conduct a preliminary survey of the materials. The information gathered from this survey would later be used in the proposal that my classmates, Lauren O’Connor, AJ Lawrence, and I wrote for our Archival Administration course (MIAS 240). This proposal was a draft for the National Endowment for the Humanities’, “Preservation Assistance Grants for Smaller Institutions”, that the Braun can use when the apply for the grant. Below are photographs of the collection, including some of the elements that I came across that suffered from extensive deterioration. In addition, there are photographs that illustrate the information being gathered on the condition of the items. One of the difficulties faced in conducting this survey, was that the library lacked proper inspection equipment, such as film rewinds. Learning to assess film and conduct a survey with such limited resources, was difficult, but it gave me tools that I will use in future preservation endeavors. 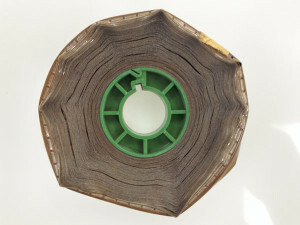 16mm color negative film with bilateral area optical soundtrack. 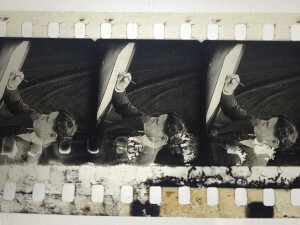 The Braun Research Library lacked proper film inspection equipment, which proved to be a challenge. 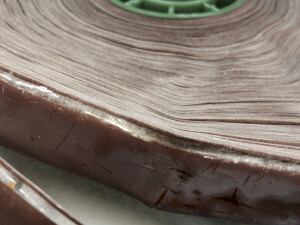 16mm magnetic soundtrack which had been fused shut, like a hockey puck, due to deterioration. 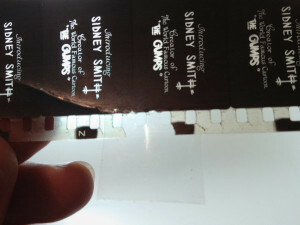 Notice the warping and buckling of the film, as well as the crystallization. 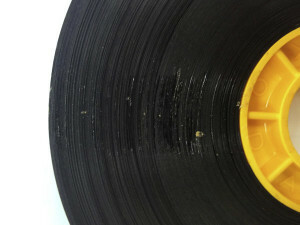 Close up of the 16mm magnetic soundtrack. 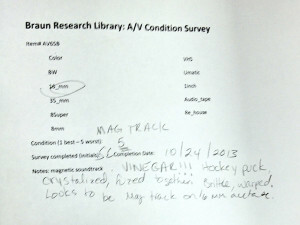 Page of the condition survey for the 16mm magnetic soundtrack with my notations. 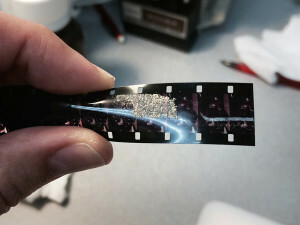 16mm color film with sticky residue that came off another roll of film that this element was housed with. Hand cleaning, followed by ultrasonic cleaning will be required. My notations for the condition survey for the 16mm film. Since August 2013, I have been working as a Graduate Assistant in the Preservation Department at the UCLA Library. 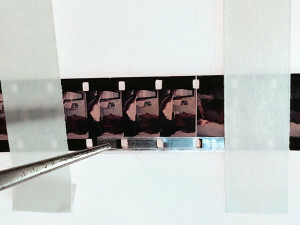 My primary duties entail inspecting and repairing film from the Synanon Foundation Records collection, as well as digitizing videotape, and maintaining the database. Below is a slide show illustrating the everyday issues that I come across while inspecting and repairing the film in the collection. 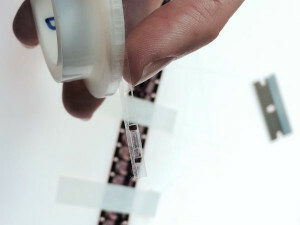 Paper tape is used to remove the dried residue from the film. 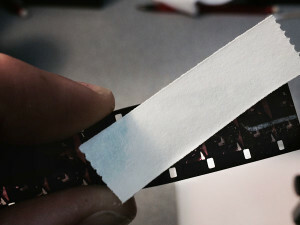 The residue is no longer on the film. 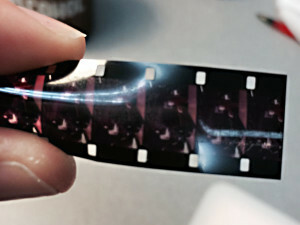 A severe tear at the heads section of a 16mm print with magnetic soundtrack. 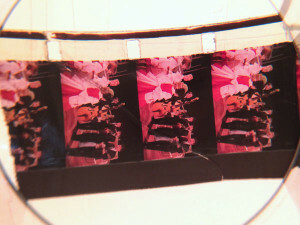 The repaired tear, as seen through a magnifying loupe, of the 16mm print.